If you love gardening and permaculture, then you’ll dig (pun intended) composting with vermiculture! So what exactly is vermiculture, and why is it becoming increasingly more popular? In its simplest form, vermiculture is a type of composting that utilizes worms, most commonly referred to as “red wigglers”, to help efficiently decompose some of our most common, every-day, household wastes. Not only does the process produce nutrient-rich “food” for gardens and plants, it saves energy and water, reduces waste in landfills and helps rebuild soil. All of these benefits come from simply feeding the worms leftover food waste from our kitchen, paper and cardboard from our purchases, and even our lawn clippings and weeds from the garden. There is a great misconception that surrounds the idea of permaculture in our modern-day society. Many folks associate the idea of permaculture as being a process most often implemented by homesteaders or hobby farmers who live off grid in a solar powered cabin somewhere way out in the middle of the wilderness. But the reality is that permaculture is nothing more than the practical application of sustainable living skills. It can be practiced by anyone, living anywhere, leading any type of lifestyle. Whether you are single, raising a family, living in the country or in a high rise building right in the middle of the city, identifying ways to adopt a more sustainable lifestyle is always a worthy endeavor. But it can be overwhelming and difficult to know where to begin. Worm composting is a great and simple way to shift your thinking and to get a true taste of what a more sustainable lifestyle looks like and feels like on a very small scale. 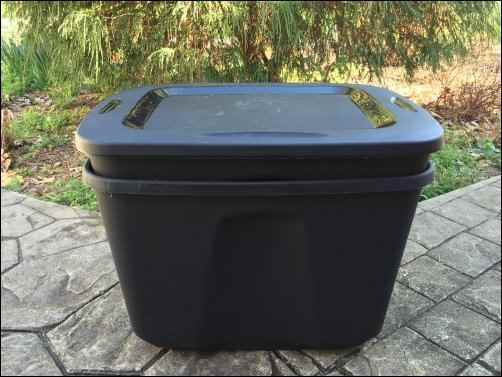 Because worm bins can be compact enough that they don’t require a lot of space, they can easily be housed in a garage, in the backyard or even on the balcony of an apartment making this form of composting quite popular among farmers, suburbanites and city dwellers alike. Creating a composting worm bin (or “worm farm” as my kids like to call it) is an inexpensive, relatively simple and educational experience. In fact, more and more teachers across the nation are incorporating vermiculture into their science lessons and even building worm composting bins for their classrooms. Lots of people ask why vermiculture? After all, what’s the point of incorporating vermiculture into your daily routine if you don’t even have a garden to feed? First, building a worm bin is just good old-fashioned fun for people of all ages. The process of watching the worms grow, multiply, breakdown the waste and produce healthy, nutrient-rich compost is fascinating for adults and children alike. Yes, the compost is best used as a means of feeding a garden or even your houseplants. However, it can also just be dumped out in the backyard or in your landscaping or any other natural, outdoor space. Anyone who grows flowers, plants or food is well aware of what an asset good, rich, high-quality compost can be for their produce and blooms. If you are not a gardener, I highly suggest donating your compost to a local community garden or offer it to a friend or neighbor who enjoys gardening. I can almost guarantee he/she will eagerly come to your home and pick up the compost directly, saving you the hassle of making a delivery yourself. “Reduce, reuse and recycle, go green, sustainably sourced, earth friendly” are all phrases we see and hear so often these days that we have become almost indifferent to what these words actually mean. But the fact that these phrases and words are abundantly overused in our modern-day society does not make them any less important or relevant. Our planet needs our compassion. Every plant, every animal and every drop of water in the sea is connected. Making one small effort to change the amount of waste we produce during our lifetime might seem pointless. But the truth is, we are all responsible for the well being of our earth. One of the greatest things about composting is that it truly does help us gauge exactly how much we consume and exactly how much waste we produce every single day of our lives. You might be surprised to learn that those of us who live in wealthy countries produce more than 3 pounds of waste per day, per person. Imagine if each of us built our own worm composter. Now imagine what an impact that simple contribution would have on our local landfills and the future wellness of our planet. It’s a worthy contemplation and in the end, the process of composting often impacts the ways we function as a consumer in our society. As a matter of fact, it was not until I built my first worm composter several years ago that I truly came to know exactly how much waste our family of 5 produced on a daily basis. It’s an eye-opening revelation when we discover just how easily we can utilize a portion of our household waste to create something useful, something good and purposeful. Building a worm composting system is simply a smart and eco-friendly thing to do. Here is a list of what you will need to acquire in order to build your worm composting system. 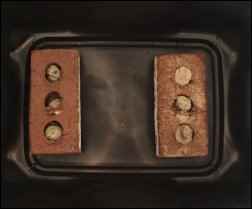 RED WORMS: The first question I get asked about vermiculture is why one cannot just go out into his/her backyard and dig up a couple hundred earthworms for their indoor composting system. The answer is simple. The worms found in your backyard are not the correct type of worms for homemade composting bins. Worm composting bins require a specific type of worm known most commonly as the “red wiggler”. Although red wigglers are considered to be a type of earthworm, they are known as “epigeic” worms. They tend to live near the surface of the soil instead of digging deep into the earth. They differ from the worms you will find in your backyard in that they can handle a rapidly changing environment that often times includes extremely rich organic matter, like the waste found in most compost bins. Red wigglers thrive in high densities and when they’re placed in a cozy habitat, they are known to breed extremely quickly and consume waste incredibly fast in comparison to the worms found in your garden. The average, everyday backyard earthworm is known, as either “endogeic” or “anecic” and they just can’t thrive in a compost bin..
Red Wigglers can be delivered directly to your home via the United States Postal Service. Typically 1,000 to 2,000 worms can be purchased at one time and they almost always arrive within a few short days. When they show up on your doorstep, they will arrive in a small box with the words “Live Animals” written across the front, which I know from experience can leave your mailperson quite perplexed at times. The worms are housed in fresh compost and packaged neatly inside a soft, drawstring bag. They typically come with a brief informational sheet or “how to” instructions. Once you open the bag, the worms can immediately be dumped directly into your preassembled composting bins with ease. They will be ready to get to work immediately, as they are hungry and in need of moisture. I ordered these worms online from Uncle Jim’s Worm Farm. 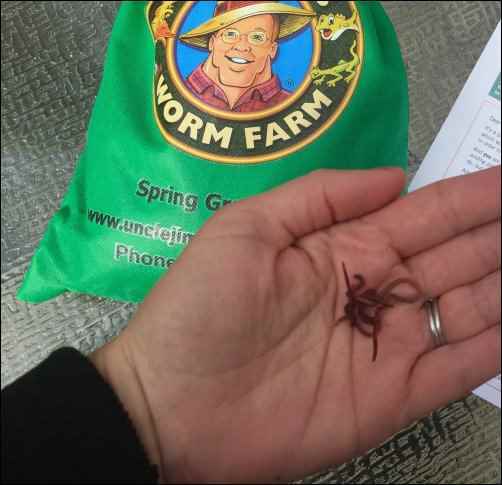 In order to find a local red worm breeder near you, simply do a quick online search. If you do not have access to a local breeder, I have used Uncle Jim’s Worm Farm and RedWormComposting.com to order my worms. Each of the companies below are affordable, efficient and the worms have always been well packaged and thriving upon arrival. STORAGE TOTES: You will need two 8-10 gallon storage totes. Many individuals believe the Rubbermaid brand is the best containers to use for composting. I have made several bins, and I’ve only used the Rubbermaid brand containers once. I’ve opted for the cheaper off brand containers in recent years and they have proven to be perfectly adequate. POWER DRILL: Handheld battery operated drill with any size drill bit. Most typically ½ inch drill bit is used, but this is not an exact science. I will note that the larger the drill bit, the more likely a few worms will slip through. I typically opt for a smaller drill bit and more holes as opposed to a larger drill bit with fewer holes. BRICKS: You will need two regular sized bricks or medium pavers to place inside the bottom container. If you do not have access to bricks, two medium rocks – close in size to one another – can be substituted. 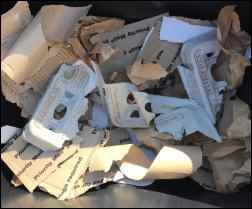 NEWSPAPER, CARDBOARD, PAPER, ASH: Shredded cardboard from old boxes, newspapers, paper grocery bags, egg crates, toilet paper and paper towel rolls are perfect to create the base of your compost layering system. If you have a wood burning stove, the leftover ashes are a wonderful add-in for your first layer. KITCHEN SCRAPS / YARD WASTE: Vegetable or fruit scraps, coffee grounds, egg shells, weeds, leaves or even dirt and mulch are excellent for layering on top of your shredded paper. FRESH WATER: You will need a spray bottle or pitcher of water to moisten your dry, paper materials. Once you have acquired all of your materials, the assembly begins. Step 1: Place the two bricks inside the bottom of storage bin #1. Leave space between the two bricks. Step 2: Turn over storage bin #2. Drill 6-8 holes randomly all over the bottom. Step 3: Turn storage bin #2 over onto one side and drill 3-4 holes directly beneath the lip of the bin. Repeat this on the opposite side of bin. Step 4: Place storage bin #2 down inside storage bin #1. Make sure that the bin is nestled evenly inside the other bin. It should sit directly atop the two bricks below. Step 5: Begin filling your bin with shredded paper materials as a base for your layering system. Fill the bin at least halfway full of the shredded materials. If the paper products mostly consist of newsprint or other thin sheets as opposed to heavy cardboard or construction type paper, you will likely need to fill the bin up well over halfway. SPRAY YOUR PAPER WITH WATER. Move the paper around and soak it well with a significant amount of water. It doesn’t need to be dripping wet, but definitely make sure that it is damp throughout. Some people soak their paper layer in a bucket of water before they add it to the worm bin. I’ve never done this and don’t believe that it is necessary, but it is an option nonetheless. Step 6: Add your kitchen scraps (no dairy, oils or meat; only vegetables, fruits, egg shells, coffee grounds, etc.) and/or your yard waste (mulch, weeds, grass clippings, leaves, etc) and spread out across top of paper. Step 7: Once you have finished adding your paper and kitchen waste gently dump your red wigglers on top of your compost materials and place the lid back on top of the bin. Step 8: Drill 6-8 holes on the lid. Spread them out to allow for even airflow. Step 9: Place your new worm composting system somewhere easily accessible. We keep ours in the garage right next to the entrance to our kitchen door. We collect our kitchen scraps all day and add them to the compost system each evening. Congratulations! You’re the proud new owner of your very own worm farm! If you feed your worms scraps daily and keep them in a space that is protected from harsh weather, your worms will begin multiplying very quickly and they will live for years to come. Surprisingly, you might even find that you will eventually need to build a separate worm bin so that you can divide your wigglers up and allow for more space. 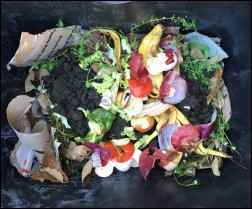 If your worms do begin to thrive and reproduce in abundance, it’s typically easy to find friends or family members who want to jump on the composting train. It’s a great project to do with friends and the benefits are clearly worthwhile. After the first 6-8 months or so, you should be able to consistently harvest some your compost every few weeks. You will actually have beautiful, rich, usable compost to add to your garden or landscaping. There’s several different ways to access your compost. Vermicompost, aka: worm poop is located at the bottom of the bin. You can easily dig down and find the rich castings, scoop them out and add them to your garden. Feel free to pick out the red wigglers one-by-one or simply drop them directly into the soil along with the compost. You can also research ways to build a worm compost tumbler or screen, which allows you to easily separate the worms from your compost. Everyone who enjoys vermiculture has an opinion on the best way to access the compost. The online “how to” articles, blog posts and video tutorials are endless. One other incredible byproduct of the worm farm is “compost tea” which can be found in bin #1 (the bin with the bricks) and although it’s not always abundant, I consider it the equivalent to liquid gold. Essentially, it is the drippings from the compost above. I’ve used compost tea to water my plants, feed my newly planted trees and fruit bearing bushes and we’ve even shared it with struggling crops in the heat of summer. The compost tea is certainly a delicious and nutritious treat for Mother Earth. Whether you want to adopt a more sustainable lifestyle or even if you’re simply looking for a weekend project to tackle with the family, worm composting is a lot of fun and great asset for the planet and your garden alike. I have 2 questions: First, if I put this on my backporch or garage, does it stink? And second, are there temp requirements? I live in the south, so if it is on my covered porch it shouldn’t get too hot? And what about cold? It rarely gets into the teens at night… but on occasion it does.